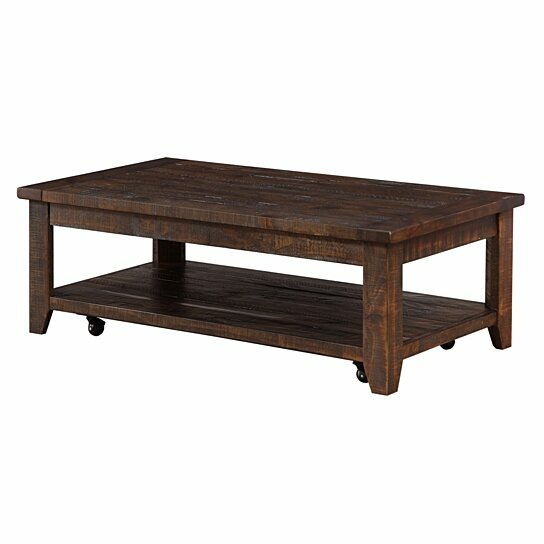 Transitionally styled with rustic influence, this Coffee Table will be a welcoming addition to your casual living room space. Made from solid pine wood in an antique mocha brown finish, this table features distinct rough-hewn saw marks that lend to the rustic aesthetic. Its spacious top and lower shelf lets you display your decorative objects, framed photos, or your favorite coffee table book, while the casters below the bottom shelf allow you to easily rearrange the look of your space to fit your exact taste. The table will form a perfect centerpiece for any conversation area and will provide you and your guests ample room for setting drinks, snack plates, purses, or display pieces. Note: Other featured items in image except this Coffee Table are sold separately. The spacious top and bottom shelf of this table lets you display your decorative objects, framed photos, or your favorite coffee table books. Made from pine wood this table will ensure long term utilization. The casters below the bottom shelf of this table allows you to easily rearrange the look of your space to fit your exact taste.